So, this big push for recycling and our focus on the world’s Seventh Resource (the materials all around us that we have a duty to use and reuse everyday) is all very 21st century- right? Wrong! Recycling and re-using our beautiful planet’s finite resources has been going on since the dawn of time. There are references to it in the Bible and, around a million years before this, Homo Erectus was learning how to repurpose his belongings out of sheer necessity. In fact, that was why recycling was so important in centuries gone by. It was all about survival. Neanderthal man could not just thump his ungainly legs down to the nearest market to buy new materials for his mud hut. He had to source everything for himself – in the face of everyday dangers – and thus every scrap of every material was used and re-used until it was dust. We have now gone full circle. The ‘carefree’ and seemingly ‘conscious-free’ days of consumerism and thoughtless dispatch have to come to end because, not only are we using up our precious primary resources but we are harming the delicate balance of our planet as we create ever more stuff from virgin materials. We should most definitely take a (copper) leaf or two from the (vellum) books of our forefathers and be far more conscious of our effect on the world, and our use of the materials around us. 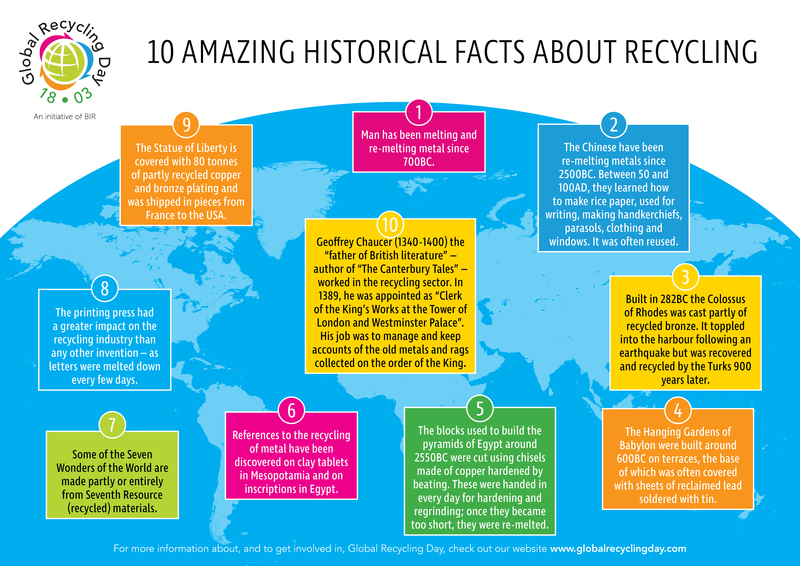 Read on for some interesting historical facts about recycling through the ages.